A common question regarding USB Flash Drives is; “Why is the actual capacity of my USB Flash Drive different from the advertised capacity?” There are essentially 3 main reasons for this, each of which is explained below. This is the most likely reason as to why the advertised capacity isn’t the same as the displayed capacity when you plug your Flash Drive into your computer or laptop. The Flash Drive file system uses storage to record information about the files stored on the Flash Drive. The specific formatting options used affect the useable storage capacity of the device. This is common with nearly every single Flash Drive on the market. More information is here regarding our capacities. 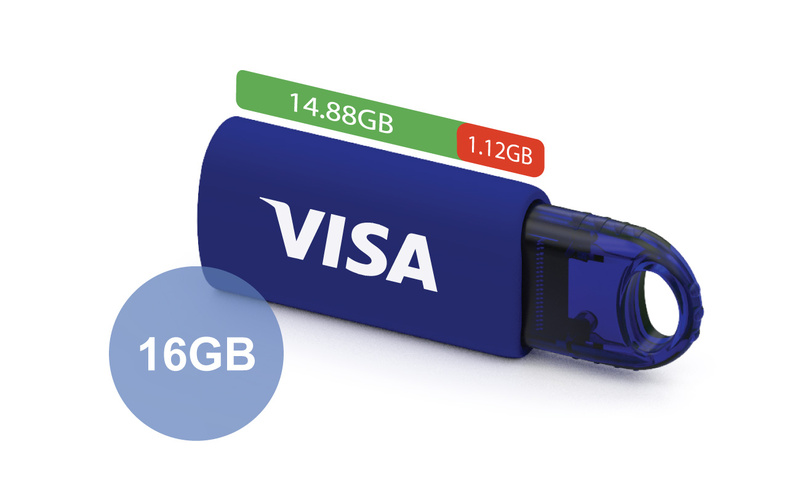 Another common reason is the fact that USB Flash Drive Manufacturers and Computer Manufacturers use different sizing conventions when talking about storage space. For Flash Drives, one KB is 1,000 bytes, one MB is 1,000KB, and one GB is 1,000MB. However, Computers sell storage in groups of 1,024 so a KB is 1024 bytes, a MB is 1024KB, and a GB is 1024MB. There's more information on this here. It’s sometimes easy to overlook the fact that there are already some files on your Flash Drive. Obviously this would be the case if you used our Data Preload service. It’s worth double-checking if there are any such files on your Flash Drive. If you’re interested in some Branded USB Flash Drives you can fill out our Quick Quote Form. A dedicated Account Manager will then be in touch as soon as possible.